Part 1: Electric Forces and Fields. called the father of modern electricity. charges while protons carry positive charges in the nucleus of an atom. other, the greater the force. but opposite in direction (in accordance with Newton's 3rd law). may be stated as follows: F = k(q1q2/r2. point charge q is, E = k(q/r2. at the position of q.
is the Permittivity of Free Space, or εo = 8.85x10-12 C2/Nm2. charges is the vector sum of the electric fields due to individual charges. net force F on charge q1 is, Fnet = F12 + F13. force on q1 due to charge q3. insulator. One of the many uses for capacitors is in computer memories. and W = qV . (voltage), V, between the two conductors. units of micro (μ), nano (n), or pico (p) farads. geometry of the capacitor, and (ii) the material between the conductors. This material is known as a dielectric. space, A is the area of a plate, and d is the distance between the plates. is the rate at which electrical charges are flowing. constant of proportionality known as the resistance. Ohm's Law are known as linear or ohmic devices. the heating elements of electrical ovens. light bulbs. These are known as nonlinear devices. drop, i.e. a place where potential energy decreases. power, can be calculated with P = VI = I2R = V2/R. charge from a lower potential to a higher inside the battery. for the emf is a volt (and thus this is not really a force, despite its name). We will use a script E, to represent the emf. 12. For resistors in series, use simple addition: REQ = R1 + R2 + … + Rn . For resistors in parallel, use reciprocals: 1/REQ = 1/R1 + 1/R2 + … + 1/Rn . Part 3: Some Early History of the Theories of Magnetism. picks up bits of feathers. two pole positions on the stone. Gilbert (1540 - 1603) whose book "De Magnete" was published in 1600.
is enviable", not the sort of thing Galileo said too often. share a prize of the French Academy as late as 1743.
strength and that the force law for individual poles is inverse square. different from physical magnetism in that he believed that he could "magnetise"
paper, glass, dogs and all manner of other substances. writes a short paper speculating that light might electro-magnetic in nature. and also shows that there is no temperature effect for diamagnetism. temperatures, and following from this the observation of persisting currents. Part 4: Magnetic Forces, Fields, and Electromagnetic Induction. the charge q, with F = qvBsinθ. θ is the smaller angle between v and B.
μo, "mu naught", given as μo = 4π x 10-7 Tm/A . (coulombs and amps) were chosen to give a simple form for this constant. set the equations equal to one another, mv2/r = qvB , and solve for r.
in meters, and θ is the angle. the force is given by F = BIL. charge to pass through undeflected, qE=F, and F=qvB , yields v = E/B. expression for the accelerating voltage in terms of v, B, and d.
given by ε = BLv. Law for current from induced Emf. direction perpendicular to the surface area. The equation is Φ = BAcos(θ) . ε = -N∙ΔΦ/Δt , with as the number of turns in the coil. B, or the area, A, or the angle theta. circuit, ε = -ΔΦ/Δt . 18. 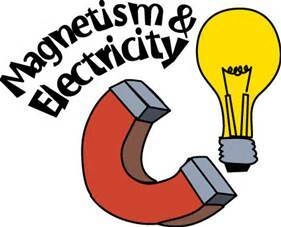 Remember that a generator changes mechanical energy to electrical energy. But a motor does the opposite. It changes electrical energy to mechanical. 19. In many cases voltage must either be "stepped-up" or "stepped-down"
power generated in the secondary, if ideal. View the Slides 1 Click HERE. Slides 2, HERE. Slides 3, HERE. For C-Code AND B-Code Problem Set #1 click HERE. For C-Code AND B-Code Problem Set #2 click HERE. For C-Code AND B-Code Problem Set #3 click HERE. For C-Code AND B-Code Problem Set #4 click HERE. For C-Code AND B-Code Problem Set #5 click HERE.